Three pro basketball players said in interviews with 15-year-old Seth that growing up in Los Angeles can help a sports career. Over the years, Los Angeles has produced some of the best basketball players in the world. Reggie Miller, Lisa Leslie and countless other superstars all started their careers at L.A.-area high schools. After speaking with some of L.A.’s best basketball players at the Summer Pro League and “A Midsummer Night’s Dream” charity basketball tournament, they said one of the reasons that L.A. is a great sports city is because it provides some of the best competition in the world. Players such as former UCLA star Jelani McCoy would drive up from San Diego on the weekends when he was in high school to “play against better competition,” he said. Players also credited L.A.’s stellar high school programs and coaches for their success. Baron Davis and Paul Pierce are two of the greatest basketball players to come out of Los Angeles, and the Lakers have high hopes for rookie Jordan Farmar as well. The players talked about how they did it and gave advice on succeeding as an athlete in L.A.
Baron Davis, who graduated from Crossroads School in Santa Monica, plays for the Golden State Warriors. He was photographed playing in the “A Midsummer Night’s Dream” charity tournament, which he recently took charge of along with Boston Celtics star Paul Pierce. Most professional athletes have to adapt to the shock of becoming millionaires overnight after signing their first contracts, but thanks to a unique opportunity, Golden State Warriors guard Baron Davis was ready. Davis grew up in a two-bedroom home in South Central with his grandparents. After Davis graduated from elementary school, Crossroads School in Santa Monica offered him a basketball scholarship. At the expensive private school, Davis was surrounded by kids from wealthier families, such as actress Kate Hudson, so he was able to learn about people from rich as well as poor backgrounds. When Davis was growing up, his grandparents kept him on a tight leash, and they made sure he did not hang with the wrong crowd. If he got bad grades, Davis was not allowed to play basketball, so he made sure not to get in trouble. Davis succeeded at Crossroads. His ball handling, which was developed by practicing on an uneven court in his backyard made of grass and cement, impressed scouts and helped lead Crossroads to California’s small-school state championship. By the time he graduated high school, Davis was named a McDonald’s All-American and the Gatorade player of the year. When it came time for Davis to choose a college, he decided to stay on the West Coast and go to UCLA. He could have gone to nearly any school he wanted, but he grew up playing pick-up games at UCLA, and decided that is where he wanted to be. After excelling at UCLA, Davis was ready for the NBA. He was excited because the Los Angeles Clippers held the fourth pick in the draft, and he felt that he could turn around the team he rooted for as a kid, and stay in L.A. to be with his family. However, the Charlotte Hornets, who held the third pick, needed a point guard and drafted Davis. At first, Davis was hesitant about playing on the East Coast, but he adapted. 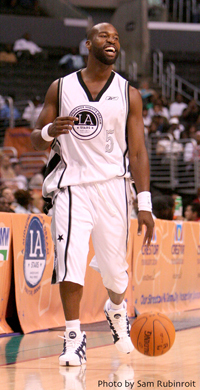 Now in his eighth season, Davis, who was traded to the Golden State Warriors in 2004, has developed into a perennial All-Star player, and one of the best point guards in the league. Davis hasn’t forgotten where he came from. He and Paul Pierce have taken over “A Midsummer Night’s Dream,” a star-studded weekend when celebrities and NBA all-stars raise funds for charity through a basketball game, streetball tournament and other activities. After hosting the event for 20 years, NBA legend Magic Johnson handed it over to Davis and Pierce this year. It benefits the Baron Davis, Paul Pierce and Magic Johnson foundations. Davis has also run camps for underprivileged kids, sponsored Amateur Athletic Union (AAU) programs, participated in Thanksgiving and Christmas present giveaways, raised funds for the Red Cross to help Hurricane Katrina victims, encouraged blacks to vote in the 2004 presidential election, and visited Navy bases. Inglewood High graduate Paul Pierce of the Boston Celtics, shown here at “A Midsummer Night’s Dream,” said that Magic Johnson inspired him. Most basketball fans in Los Angeles today root for the Lakers or the Clippers. However, if you grew up in Inglewood as Paul Pierce did when the Lakers played in the Forum before moving to Staples Center, the Lakers were the only team that mattered. While attending Inglewood High School, Pierce practiced just minutes away from where the Lakers played. Pierce was a starter on the basketball team all four years of high school, and quickly became a star. He credits living so close to the Forum for steering his interest toward basketball. While Pierce was growing up, Johnson led the Lakers to five NBA championships and was named the NBA MVP three times. Pierce was awed by Johnson’s amazing court awareness and passing skills, and learned from Johnson’s leadership role. Pierce considers Johnson his greatest influence growing up. After graduating from Inglewood High School, both the University of Kansas and UCLA heavily recruited Pierce. Unlike Davis, Pierce decided to leave the West Coast and attend Kansas. Pierce made the most of his experience at Kansas. He was MVP of the Big 12 Conference Tournament twice, and was named a first-team All-American by The Associated Press. In 1998, the Boston Celtics got a steal when Paul Pierce slipped to them at the 10th pick. Do you think the Clippers, who drafted Michael Olowokandi with the first pick, and the Dallas Mavericks, who drafted Robert Traylor with the sixth pick, would like to redo that draft? While playing with the Celtics, Pierce earned respect for playing tough and playing well in the clutch. Shaquille O’Neal nicknamed Pierce “The Truth” because his game is for real, and the hype surrounding him is not just a myth. Pierce has been an All-Star the last five seasons, and he was the only Celtics player to ever lead the NBA in total points scored in a season. Along with his involvement with “A Midsummer Night’s Dream,” Pierce and his Truth Fund have raised more than $600,000 for charity. Taft High graduate Jordan Farmar said it’s a blessing to play for his hometown L.A. Lakers. Rookies usually have a tough time making the transition to the professional level, but Jordan Farmar, currently 19 years old, will not have a shortage of advice. Jordan, the Lakers 2006 first round draft pick, is the godson of Eric Davis, a former professional baseball player, and the son of Damon Farmar, who played in the baseball minor leagues. Farmar was a star basketball player at Taft High School in Woodland Hills. He scored a school record 54 points in a single game and had more than 2,000 points in his two seasons at Taft. As a senior, he led his team to their first Los Angeles City title, was named the Los Angeles Times Player of the Year and was a McDonald’s All-American. After high school, Farmar decided to go to UCLA and stay in Los Angeles because “I wanted to stay home and be close to my friends and family,” he said. Farmar excelled at UCLA. As a freshman, he was named Pac-10 Freshman of the Year, and started every game. As a sophomore, he shocked the country by leading the Bruins to the national championship game, where they lost to the Florida Gators. Now that Farmar is going to play for the Lakers, he is the rare person who is able to grow up, and play college and professional ball in the same city. After all these years, Farmar knows there are distractions in L.A. that can hinder your development as an athlete, and he has tried to avoid them. Jordan Farmar’s father Damon acknowledges the problem distractions pose. 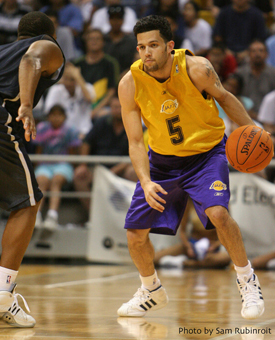 Jordan Farmar’s advice for L.A. athletes: “Keep working. Follow your dream, whatever it is, go ahead and do it."